My teenage daughter loves her t-shirts! We did spring cleaning in her packed closet and she refused to get rid of her t-shirts. I told her we would put them into a bag until I could think of what to do with them. My first thoughts were donation or car rags. After I calmed, I had to think of how to recycle these t-shirts. Pillows, totes, etc. I needed to do something fresh. So, it's been pretty warm here (80 degrees +) and decided on a halter. 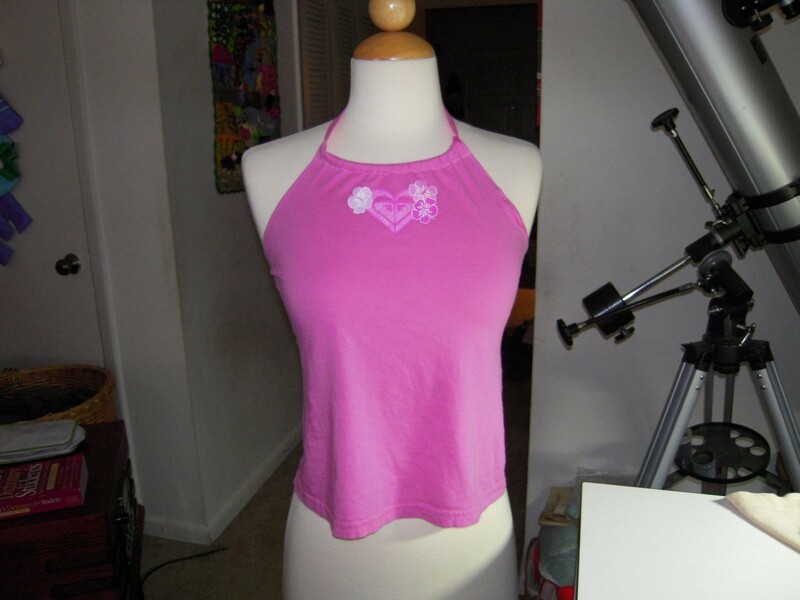 Now the 6 year old wants her t-shirts recycled into halters. It's really easy to do and I'll show you how! Start with a t-shirt; scissors; trim or ribbon (for tie); 1/2" wide elastic; pie tin or french curve ruler. And, of course thread to match and sewing machine. Cut off the ribbing of the t-shirt. 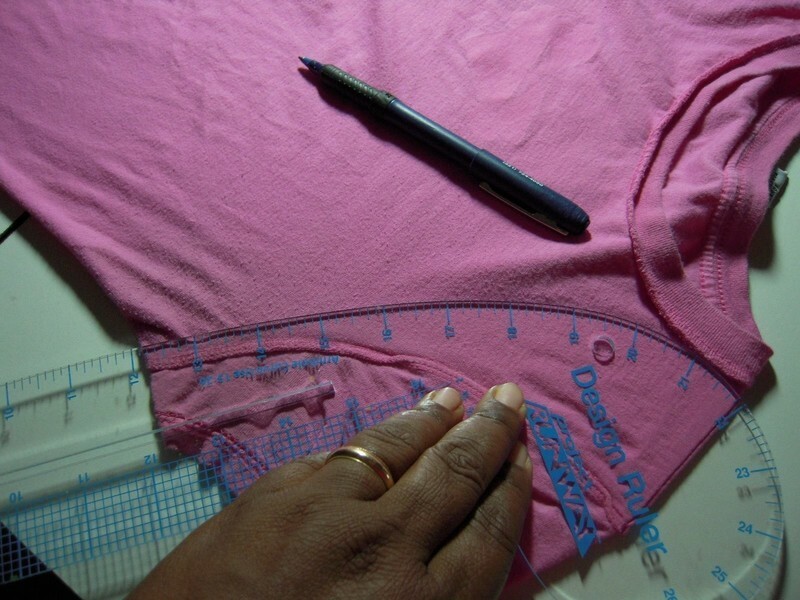 Fold the t-shirt about 1/8" toward the wrong side at the sleeve and neck areas; stitch. At the neckline, fold another 3/4" creating a casing for the trim to feed through; stitch. 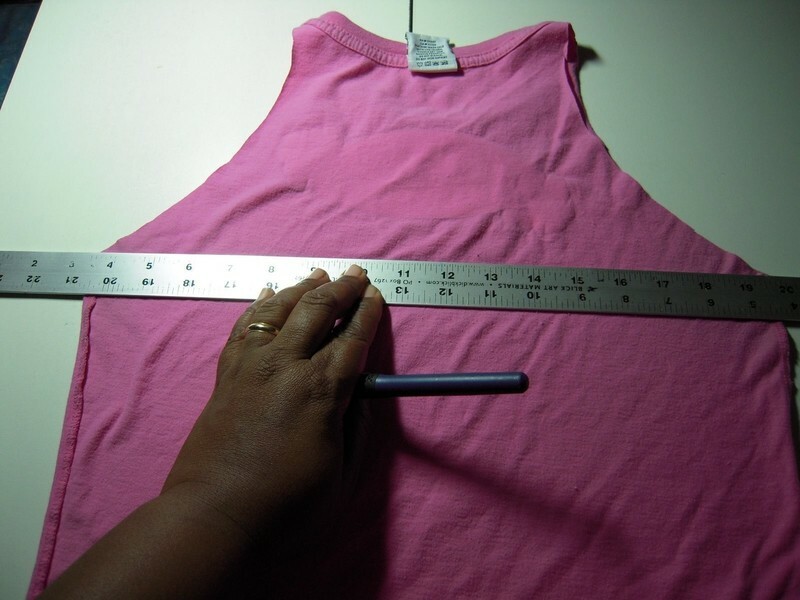 Cut a length of elastic to fit across the back for desired fit. 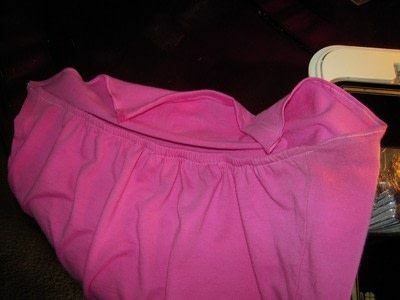 At the back, fold t-shirt 3/4" toward the wrong side with the elastic encased in the fold. Pin the elastic short ends in place. Stretch the elastic as you sew, stitch down the elastic middle to secure. See pic below. Pin a safety pin to one trim or ribbon short end. Thread/feed the pinned end through the neck casing. Gather the t-shirt at the neckline. 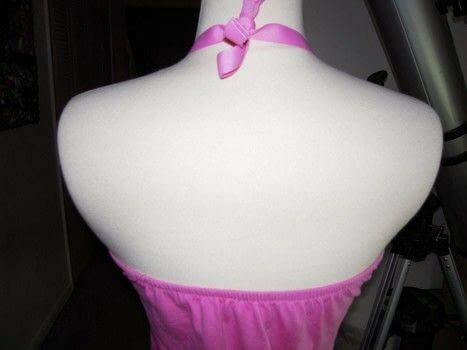 Make sure the trim/ribbon is long enough to tie around neck. Remove the pin; cut and knot the trim/ribbon ends.